In June 2010, the Trinidad and Tobago Computer Society put together some comments regarding the laptops-for-children program (in which every child going on to secondary school will be provided with a laptop) that the Government of Trinidad and Tobago was proposing to implement for September 2010. These comments were forwarded to the Ministry of Education. The Ministry of Public Admin (MPA) has released a “Draft National Policy on Electronic Business for Trinidad and Tobago” around July 2008 for comment. Developing the Nation’s R&D and Innovation Capacity. This policy framework intends to identify actions that the Government of the Republic of Trinidad and Tobago (GoRTT) will need to take in order to create an economic, infrastructural and human resource environment in which e-Business opportunities can thrive. These actions will be taken in collaboration with the private sector, academia, NGO’s and citizens. In this regard, the proposals herein are structured to minimize the direct intervention of Government in taking these proposals forward. This is to encourage increased competitiveness of the ICT sector in Trinidad and Tobago. The TTCS submitted the comments after having a wiki page to document answers respond to the questions in the draft policy, followed by a F2F meeting on October 11 2008. “The aim of this paper is review the role of the Open Source Software (OSS) model within the broader societal goals of economic and social development. The issues discussed herein shall be critical to further engage the Public Service and the wider national ICT sector in developing an action plan going forward. Such a national discourse and action plan will go a long way in meeting the objectives of fastforward, the National ICT Plan, and the regional action plan for the information society, eLAC2007. 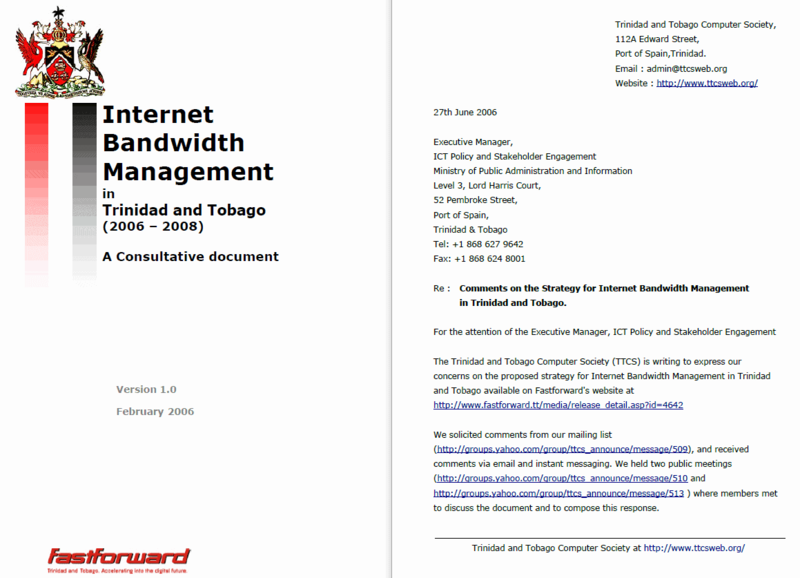 The Internet Bandwidth Management proposed policy was released for comment in June 2006 by the Ministry of Public Administration and Information (MPAI). that the cost of external Internet bandwidth and the hosting of content outside of Trinidad and Tobago is detrimental to the local economy and is a hurdle to e-commerce and content development and to the success of Government’s Fastforward initiative. act as a catalyst for local content being released under Creative Commons and for the marketing of proprietary content. create a robust foundation for e-Business/e-Commerce. act as a catalyst for use of local content based services such as data warehousing and tele-medicine. employ techniques for efficient utilisation of bandwidth such as compression of content/data and caching servers. local ISPs peering through a national IXP to facilitate local hosting. Read the Ministry announcement of the proposed Internet Bandwidth Management strategy. On November 1st, 2006, the Ministry of Public Administration and Information (MPAI) held a workshop to discuss “Internet Bandwidth Management” Strategy with interested stakeholders. The MPAI has released a summary of the workshop. This draft policy was released by the Telecommmunications Authority of Trinidad and Tobago (TATT) in December 2004. The deadline for comments on this policy was December 31st, 2004. The Trinidad and Tobago Computer Society (TTCS) obtained this paper document and scanned and converted it to a PDF in late December 2004. In January 2005, the TATT website came online and has made available the policy. This draft policy was released by the Telecommunications Authority of Trinidad and Tobago (TATT) in December 2004. The deadline for comments on this policy was December 31st, 2004. The Trinidad and Tobago Computer Society (TTCS) had obtained these paper documents and scanned and converted it into a PDF in late December 2004. In January 2005, the TATT website came online and has made available these draft policies for download. TTCS comments on Draft Policy on Micro, Small and Medium-sized International Public Telecommunications Services and/or Networks in Trinidad and Tobago (TXT file ; 30K). individuals may access personal information about themselves held by an organization and have it corrected, if necessary. This Data Protection Policy is based on the North American Model and meant to be compliant with rigorous standards for the protection of personal data as outlined in the European Union’s Data Protection Directive and takes into consideration the objectives of fastforward while focusing on the need to be compliant with the target market laws on which we are focused including compliance with the US HIPAA Act. The Telecommunications Amendment Bill, 2004 was passed in the House of Representatives on the 20th April, 2004. It was passed in the Senate with amendments on 18th May 2004. The House of Representatives approved the Senate Amendments on the 26 May 2004. It was assented to on June 14th, 2004. 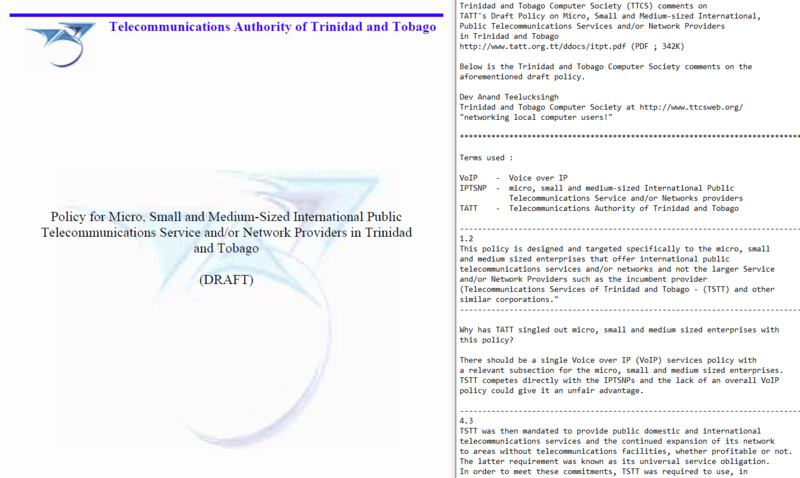 Trinidad and Tobago Parliament’s website on the Telecommunication Amendment Bill, 2004. Contains the transcripts of the speakers in both the House of Representatives and the Senate and other information as the Bill went through Parliament. In early May 2004, the Ministry of Public Administration & Information released a proposed policy “to exempt licensing of systems operating in the 2.4GHz and 5.8GHz Industrial, Scientific & Medical (ISM) Bands for the provision of affordable wireless connectivity and Broadband Internet Access”. The proposed policy recommends the use of 2.4GHz systems (such as 802.11b, 802.11g, Bluetooth) to be deployed within the constraints of or between the user’s premises for non-third party applications and 5.8GHz systems (such as 802.11a) to be deployed for both public and private network services. The deadline for comments from the public on this proposed policy was Friday 28th May 2004. The 2.4GHz band should be given the same privileges as the 5.8GHz band and let users/market forces decide which band is more appropriate for their needs. In other words, 2.4GHz systems should be allowed to be deployed for both public and private network services, just like 5.8GHz systems. Spectrum Plan for Accommodation of Broadband Wireless Access (BWA) Services. 6.3.4 Individual or user licences will not be required in order to use radiocommunication equipment in the 2.4 GHz band. 6.3.5 Radiocommunication systems using the 2.4 GHz band can be used for both private or public telecommunications networks and services or broadcasting services. The Draft Policy on Broadcast and the Broadcasting Industry was released for public comment on the Trinidad and Tobago Government’s website in early August 2002 by the Ministry of Science, Technology & Tertiary Education. The Draft Policy includes proposals on the ownership structure of the broadcasting industry, a quota system for local programming content, non-profit and religious broadcasting among other issues. With the deadline for submissions for comments on October 31st, 2002, the Trinidad and Tobago Computer Society (TTCS) submitted comments on the Draft National Policy and the Broadcasting Industry. The Minister of Public Administration and Information announced the National policy on Broadcast and the Broadcasting Industry in the Senate on Tuesday 20th January 2004 and was made available for download from the NICT/FastForward website in February 2004. Download National policy on Broadcast and the Broadcasting Industry (PDF; size 108K).